The House on Tuesday passed a bill to fund the US government through March 23 and the Pentagon through the year. But Senate leaders on Wednesday announced a massive two-year spending deal that would extend government funding in the short term while paving the way for a broader budget deal. Some House members are wary of the early details of the Senate deal. Government funding must be extended by the end of Thursday to avoid a shutdown. Senate leaders on Wednesday announced a massive bipartisan budget deal designed to end Washington’s cycle of short-term funding fixes. But it’s unclear how it will be received by each party’s rank-and-file members as leaders work to avoid another shutdown before Friday. The deal is expected to increase defence and domestic spending by just under $US300 billion over two years, as well as provide billions of additional dollars in disaster-relief funding. “After months of legislative logjams, this budget deal is a genuine breakthrough,” he said. Senate Majority Leader Mitch McConnell echoed Schumer’s sentiment. Among other things, the deal would extend the debt-ceiling deadline by one year and increase spending for defence and nondefense programs beyond the caps imposed by the 2011 Budget Act’s sequestration. Both Democrats and Republicans favour lifting the budget caps. Under the Senate deal, defence spending would get a $US165 billion boost over the next two years, and nondefense would get $US131 billion more. The deal’s announcement comes less than two days before the federal government is set to once again run out of funding. The House on Tuesday voted to advance a different bill that would keep the government funded through March 23, but that legislation will be gutted and the new deal inserted in its place, meaning the House must again vote on it. Once Congress lifts the caps, the two parties will then have to agree on the amounts that individual programs would receive. Such a deal would also need to fund the government until leaders agree on more specific details. Nearly $US300 billion in additional funding for defence and nondefense over the next two years. $US165 billion in defence spending, with $US80 billion in fiscal 2018 and $US85 billion in fiscal 2019. $US131 billion in nondefense spending, with $US63 billion in fiscal 2018 and $US65 billion in fiscal 2019. A debt-ceiling deadline suspension of one year, with the limit re-imposed on March 1, 2019. $US6 billion over two years to combat the opioid crisis. $US20 billion over two years for new infrastructure investments. An extension of funding for community health centres and a variety of other Medicare programs. Close to an additional $US90 billion in funding for areas affected by natural disasters in 2017. $US2 billion over two years for the National Institutes of Health. Resistance from both parties could trip up the deal in Congress. Schumer and McConnell announced the agreement as House Minority Leader Nancy Pelosi was throwing cold water on it from that chamber’s floor. 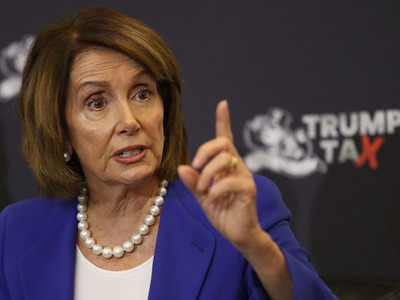 Pelosi said she would not support the Senate budget deal unless House Speaker Paul Ryan committed to a vote on immigration legislation. The Senate deal does not address immigration – particularly the Deferred Action for Childhood Arrivals program, which has become a flashpoint in recent congressional funding negotiations because it is set to expire soon. Amid last month’s three-day government shutdown, Senate Democrats said they agreed to open the government only because Republicans promised to work in good faith toward a solution. Pelosi spent more than two hours on the House floor on Wednesday relaying stories of the young unauthorised immigrants whom DACA protects from deportation, known as Dreamers. The lack of any tangible progress toward a DACA deal and its absence from the latest Senate negotiations have left many of Pelosi’s rank-and-file members concerned. Conservative House Republicans have also expressed qualms about the reported Senate deal. The House Freedom Caucus, a hardline conservative group of roughly 30 Republican representatives, is for the most part against the deal, according to a source close to the group. Florida and Texas would most likely receive a chunk of the disaster-relief funding in the Senate deal. Other conservatives have expressed concerns about the outline of the deal. The House would have to vote on any legislation that could arise out of the Senate deal. President Donald Trump on Tuesday suggested that if Congress does not agree to the White House’s immigration framework, which focuses on border security, he would “love to see a shutdown,” though the White House has signalled its support for the latest budget deal.